"The Simpsons" isn't just one of the most popular and successful television series of all time - now, thanks to LEGO® and Bricks to the World, it's a magical wonderland that your kids can enter whenever they'd like! With the LEGO® "The Simpsons Series" Minifigures, your children can add the entire cast of characters from the show to their make believe worlds at a moment's notice! Bring Bart, Lisa, Maggie and even Moe the Bartender into your home from Bricks to the World today! Even the lovable town slob Barney is here to get in on the action! Hello Sprinfield the LEGO® BrickHeadz™ Homer Simpson & Krusty the Clown! This LEGO® BrickHe.. Welcome to The Kwik-E-Mart—your one-stop shop for convenience foods at inconvenient prices! 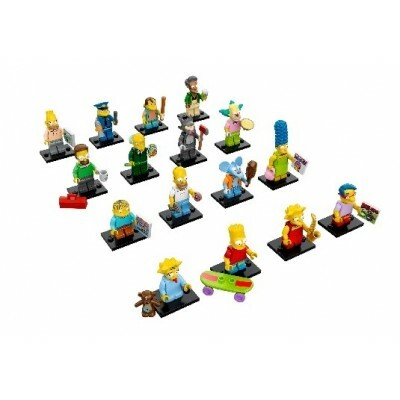 Visi..
Ay carumba – it’s a brilliant second LEGO® Minifigures series for The Simpsons™! This cool coll..